With 5 bars, leaves more space in your closet, one hanger equals 5 hangers. A good closet helper. Clothes stay compact, organized and wrinkle-free due to this efficient hanger. Used for clothes, towel, scarf, trousers, slacks, ties, shirts, blouses, sweat pants, etc. MULTI FUNCTION?. CLOTHES HANGERS SAVING SPACE CLOSET ORGANIZER MAGIC WONDER RACK. 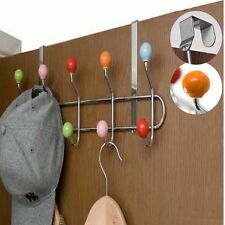 Instantly transform your closet with this Hanger Plastic Space Saving Hanger. Each Hanger holds several pieces of clothing, works with any type of hanger and enables clothing to hang either horizontally or vertically. 8 x Magic Clothes Hangers. Easy to assemble and hang on any standard closet rod. 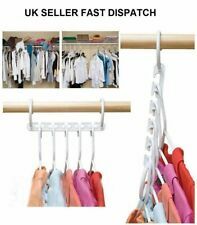 Instantly transform your closet with this Hanger Plastic Space Saving Hanger. Each Hanger holds several pieces of clothing, works with any type of hanger and enables clothing to hang either horizontally or vertically.